Beau Hancock is a freelance dancer, choreographer, and teacher who earned his M.F.A. in Dance from Temple University. Beau was a founding member of the Bowery Dancers, a Lawrence, Kansas-based movement collective and has had his choreography presented at the Merce Cunningham Studio, Wesbeth Art Gallery, Movement Research at DTW, the Flea Theater, Chi Movement Arts Center as a part of the Philadelphia Fringe Festival, and the Painted Bride Arts Center as a nEW Festival Artist-In-Residence. Beau has taught at Georgian Court University, Pioneer Valley Performing Arts High School, University of Kansas, Indiana University, Wayne State University, and Temple University. He is currently on faculty at Rowan University. As a performer, Beau has had the pleasure to work with Ben Munisteri Dance Projects, Ellen Cornfield/cornfield dance, Kathy Dunn Hamrick Dance Company, Douglas Dunn and Dancers, Merian Soto/Performance Practice, Nichole Canuso Dance Company, Bronwen MacArther/MacArther Dance Project, Olive Prince Dance, and Miro Dance Theatre. Caitlin Quinn Pittenger received her M.F.A. in performance from Temple University and her B.A. in dance from Goucher College. She currently serves as an Assistant Professor of Dance at Stockton University. She was also Georgian Court University's Artist in Residence and has been an adjunct faculty member at Temple University. Pittenger has worked with artists such as Anne Hutchinson Guest on a restaging of the ballet the Afternoon of a Faun, Mino Nicholas, Adrienne Clancy, Rain Ross, Eva Gholson, Tiffany Mills, Beverly Brown, Nicole Canuso, and Merian Soto. She also serves as an adjudicator and master teacher for the Monmouth County Arts Council Teen Arts Festival as well as master teacher at numerous colleges and high schools on the East Coast. Meredith Rainey was a soloist with Pennsylvania Ballet and also performed with Milwaukee Ballet, Dance Theatre of Harlem, and as a guest with Alvin Ailey American Dance Theatre. His work has been commissioned by Pennsylvania Ballet, Incolballet (Ballet Clásico Nacional de Colombia), Brandywine Ballet, Ballet X, Delaware Ballet, Hubbard Street 2, and Phrenic New Ballet. Mr. Rainey has received numerous awards including the 1995 & 2002 PA Council on the Arts Fellowship Grant for Choreography, 2001 Mid Atlantic Arts Foundation Artist as Catalyst Grant, 2002 Independence Foundation Fellowship in the Arts, 2010 Dance Advance Grant, and was a finalist for the 2003 Pew Fellowship in the Arts. In 2011, he won The Joyce Theater Foundation’s the A.W.A.R.D. Show! Philadelphia. Mr. Rainey has taught ballet and been commissioned by higher learning institutions throughout the Mid-Atlantic region, including Bryn Mawr College, Swarthmore College, Muhlenberg College, and University of the Arts. Nadra Assaf received her M.F.A. in Dance from Sarah Lawrence College, and a Doctorate of Education from Leicester University. She has been teaching at the Lebanese American University since 1991. Her recent dance productions include: STS: Space-Time-Shape (2012), I Matter: An Audience Interactive Performance (2010), The Faces of EVE (2008-2009), and Majnoun Leila (2007). She is the Artistic Director and founder of Al-Sarab Alternative Dance School (1991 to date). In April 2011 she organized and implemented the first annual International Dance Day Festival in Lebanon. Among her publications: The Meanings of a Modern Dance: An Investigation into the Communicative Properties of a Non-Verbal Medium (2009); “I Matter”: An Interactive Exploration of Audience-Performer Connections (2012). Rebecca Brodowski is a graduate from Stockton University with a B.A. in Dance. Brodowski is the Assistant to the Director for Rain Ross Dance and a company member. 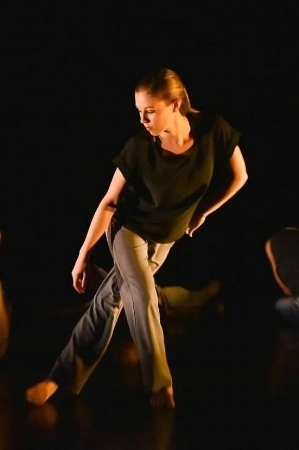 She has recently performed in the Developing Community Through Dance in Lebanon performance in NYC which demonstrated bringing art together from Lebanon as well as the U.S. Brodowski has also traveled with Rain Ross Dance to Richmond, VA to perform in the 13th Annual Choreographers Showcase. Beyond RRD, she has performed works by Jon Lehrer, Henry van Kuiken, and Beau Hancock. During college, she choreographed her own pieces for Stockton University as well as Mercer County Community College's Mercer Dance Ensemble. She most recently has been on faculty at Mercer County Community College. Macy Collins has performed in NYC with Rain Ross Dance, and most recently with Caitlin Quinn Pittenger in Philadelphia. Previously, Collins has performed the work of Jon Lehrer, Hannah Baumgarten and Diego Salterini of Dance Now! Miami, and Meredith Rainey. She is excited to continue to have opportunities to perform and grow as an artist, while she also pursues her interest in Occupational Therapy. Kahra Woolverton holds a doctorate in Physical Therapy and is currently a PT at Atlantic Physical Therapy Center. She has been dancing for 20 years and continues to perform in the tri-state area. She brings together the worlds of Physical Therapy and dance in her research on the prevention and rehabilitation of dance injuries, as well as her continued participation in performances. Erin Brody began dancing in Hamburg, New Jersey and is currently studying Dance Pre-Movement Sciences at Stockton University. She has previously worked with numerous artists including Beau Hancock, Gallim Dance, and Jae Hoon Lim. After graduating, she plans to continue her education and become a Dance Movement Therapist to provide help to others through movement. Vanessa Camporeale is from Jackson, New Jersey and is currently a junior at Stockton University pursuing a dual degree with majors in dance and business. She has studied under artists such as Rain Ross, Chandra Moss-Throne, Beau Hancock, Caitlin Quinn Pittenger and Dylan Pierce. While at Stockton University she has performed in various student works as well as under established artists such as Germaul Barnes and Bryn Cohn. Alisa Iacovelli is currently completing her dance education at Stockton University. She has worked and studied with artists including Rain Ross, Jae Hoon Lim, Chandra Moss-Thorne, Beau Hancock, Henry Van Kuiken, as well as Asya Zlatina and Caitlin Quinn Pittenger, who she has performed with professionally. Throughout her undergraduate training at Stockton University, Iacovelli has performed in works under the direction of acclaimed dance companies such as Gallim Dance, Lehrer Dance and Robert Moses’ Kin. She has presented her choreography at the American College Dance Association conference in 2016 and in 2018. Hailey Massimino began her dance training at the Academy of Performing Arts in Woodstown, New Jersey and has furthered her education in dance performance at Stockton University. During her time at Stockton she has studied under her professors of Rain Ross, Caitlin Quinn Pittenger, Beau Hancock and Chandra Moss- Thorne to name a few. 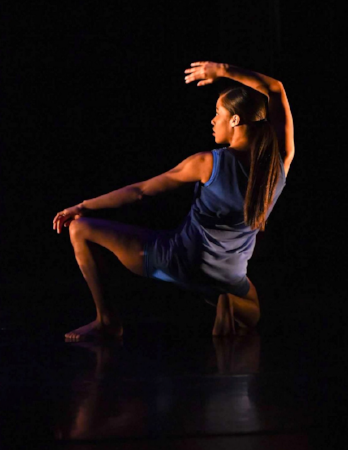 Hailey has had the opportunity to perform professionally choreographed works by Jon Lehrer of Lehrer Dance and Robert Moses of Robert Moses’ Kin. In May, Hailey will graduate from Stockton with a B.A. in dance performance. She owns a dance studio outside of Philadelphia and will continue to perform and present her own choreography. Cat Messe loves to dance and is so thrilled to perform with Rain Ross Dance. Jasmine Norwood has been dancing for over 17 years. Her training is mostly in contemporary and modern. She is currently attending Stockton University in New Jersey where she is part of the Stockton Dance Company. She is majoring in Business Studies with a minor in Dance. She has performed in many shows that include Stockton’s Spring Dance Concerts, showcases, conferences and festivals. She is also a company member in Pieces of a Dream Dance Company located in Wilmington Delaware. In addition, her goals are to continue performing in numerous performances after college and own a dance studio. She loves to perform and wants to teach, inspire and have a positive influence on those students who have a desire to dance. Casey Van Newenhizen is from Atco, New Jersey and is currently a senior at Stockton University studying Dance and Pre-Physical Therapy. She has worked with artists such as Meredith Rainey, Bryn Cohn, and Robert Moses' Kin. This past summer, she attended Bates Dance Festival and this past winter trained with 10 Hairy Legs in New York City. After graduating, Casey plans on continuing her dance career in Philadelphia and New York and eventually returning to school for a doctorate in Physical Therapy to continue working with dancers.